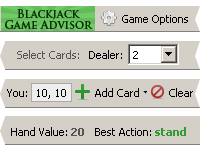 Blackjack Game Advisor 1.01 - Download Win Apps. Blackjack tool that gives advice on any blackjack hand based on basic strategy..
A firefox toolbar that gives advice on any blackjack hand based on basic strategy. The application uses general rules for blackjack which can be modified according to the number of decks, rules of doubling and splitting and other rules of the game. Players can change the options of the game, select player's cards and dealer's up card. The advisor gives the result according to the input parameters and users can apply the result right in the game.